Please Note: Pictures are for illustration purposes only. Cassette and Rear Derailleur are sold separately. The OneUp 40/42T Sprocket is a cost effective way to extend the gear range on your 10-speed drivetrain. 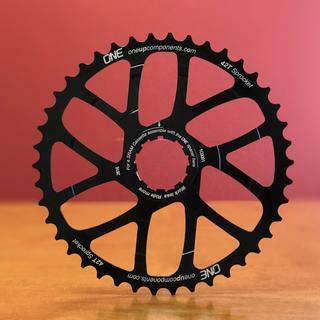 Compatible with both 1x and 2x drivetrains, the OneUp 40/42T Sprocket easily installs to your 11-36T or 12-36T cassette (not compatible with all 10-speed cassettes; see below for details). To install, you simply remove the 17T cog and 1 cassette spacer from your freehub to make room to slide this giant cog on €“better yet, the OneUp 40/42T Sprocket now ships with a 16T cog to replace both 15T and 17T to provide more even cassette progression which results in a smoother cadence with improved shifting. i bought this ex-cog to convert my scott hard tail to a 1 x 10. the install was easy, and one up industries is great at replying to your questions in a timely manner. i am running this thing with my brand new 11-36 shimano XT cassette, and the install was prett simple. it is a big jump from the 36 to the 42 tooth ex-cog and it doesnt shift as smooth as a would like, but it was expected. you also have to replace one of the cogs in your cassette with a supplied cog as well, and i still have not gotten it to shift very smooth between the shimano cogs and the installed one up cog. i am still hopeful i can dial it in. so far, i am loving the simplicity of having no front derailleur, but you will definitely notice the gearing change. i am running a 32T front chainring and when engaged with the 42 T one up cog, you get a gear ratio of roughly 1.3, while with my stock setup, i had a 24T front and a 36T rear cog and a granny ratio of 1.5. you will notice the difference in your first ride or two during some long climbs, but if you are intrigued by simplifying your bike, this is the way to go. Works well so far using a 2015 10-Speed deore rear derailleur. No need for longer B screw. Some derailleurs (XT and XTR) may need a new oneup rdr cage too to make it not skip, which begs the question: should I just go to 11-speed setup? I needed more "granny gear" for my 1x10 mountain bike. I run a 32 tooth chain ring and this cog gives me the extra gear I need to make my climbs. Way cheaper than going to 11 speeds, and the 16 tooth cog they include with the kit makes a much nicer gear progression. I can't recommend this product enough! Need that extra gear when i switched to a 1x and this worked perfectly. Paired up with the Radr Derailleur cage i have had no problems with skipping or shifting on the 16 or 42 tooth. This is a great product, same as everything i've used from Oneup Components. Easy to install and does what it's supposed to. All the benefits of 2x10 with less weight, and only one shifter, so much better! I mountain bike 2 to 3 times per week, I converted my 3x9 to a 1x10 the One Up set up works great, the replacement 16t is a nice bonus for easy shifting. My drive train has no problem shifting up to the 42t with a Shamono Shadow XT with a clutch. I'm running a 30t Race Face chain ring, I probably could of got away with a 32t for a bit more speed on the DH. This set up is defiantly worth the up grade, my bike is a Turner 5 Spot with DW suspension, no need for a chain stay set up. Really nice cog, seems to be quality build. Installation was quite easy. Excellent upgrade for a 1x10 drivetrain - have one on each of my bikes. More versatile than some of the competition in that it fits both SRAM and Shimano. Can't see why you would need 42t - 34x42 is low enough for mad wheelies every Wednesday! Easy to install. It does increase the bike range as expected. Working on shifting issues that have ensued, I have a zee and the 40t. goes on easily, shifts/looks great! It's really what you need to upgrade you cassette from 36t cog to 42t, just follow the intructions from Oneup to install. It's better to install a new chain and also follow the instructions from Oneup for the length. You have to ofetn lubricate your chain too otherwise all gearings shift smoothly. I was very happy that this installed as easy as it did. In 15min I had my bike apart, back together, and shifting smoothly. For some reason I really expected to have to mess with my rear derailleur more to get this my bike shifting correctly, only needed to adjust my b-limit screw for the new 40t. Easy to install and made all the difference! No need to get an expensive 1x11 just use this gear and your good! Been using these since they were 1st introduced. I like that they offer 40t which doesn't seem to spin out as much on loose climbs. Wear has been minimal with 5 days of riding a week on it. Even though I replace the drive train once a year, it hasn't skipped ever and still has plenty of life yet in it, which is why I give the old ones to friends for then to try an inexpensive alternative to 1x11. Went with 40T option. Great solution to expand my range w/o going to 1x11 and spending much more. Shifts well, I like the 16T replacement for 15T and 17T. Makes for a pretty smooth transition. Now with 30T front chainring I feel like it's about perfect for my fatty when I need just a bit more spin. I got this for my wife to transition her to a 1x10 set up. I added the expander cog and removed the 22 tooth ring upfront. She could tell the difference in the easiest ring, with the 42 tooth expander cog and a 32 tooth chain ring it wasn't as easy as the 32x22 set up. thats pretty sensitive considering the gear ratio's are .7 and .8. But it wasn't enough for her to not like it. and it cleans up the cockpit. The only downside is that the expander cog is only compatible with certain cassette's unless your willing to sacrifice some shifting performance in the last two cogs. Easy to install and five minutes to adjust. It's perfect for 1X10 set up. This 42 tooth expander cog is working great so far. OneUp has a nice video tutorial and great instructions with pictures on how to install and make adjustments. I installed this with a Shimano slx cassette and followed the directions to cut the spacer between the 15t and 17t cogs and it works just fine. Using it with a new 1x10 setup. It's almost too beautiful to throw on the bike! Prompt delivery to my doorstep. I put this on my '15 Intense Tracer 275 carbon as an addition to the 10 spd xt drive train. what a great addition to anyone's drive train. shifting is smooth. I put this on along with my RadR cage and can't believe how smooth the shifting is. Gotta have the 42t cog for climbing in SoCal if you want a single narrow/wide chainring in front. I upgraded to a Shimano XT Shadow GS (short) cage derailleur and bought OneUp's RAD cage to go with it. Very pleased with the end results. Shifts well and did not need a longer B-spring bolt. I'm using this on my fat bike with a 30T NW front ring and sram Clutch Deraileur. The 16t cog really helps in making it shift well. Also shift great to the 42t cog. This cog is perfect. Fits both Sram and Shimano. Shifting has been flawless. I bought this extended range cog for my girlfriend, and she loves it! It lets her get a way better gear ratio than her 36 tooth. On the shimano cassette the one up 16t cog didn't work as smooth as the stock shimano cog. I purchased this to go 1×10. Put it on with XT cassette and removed the 17t. Fit was perfect. A few easy adjustments necessary. Great conversion to a 1X10, the 16T actually does help bridge the gap and is a nice addition. The install videos on 1Ups website are easy to follow and offer just enough detail to feel confident in your install without sending all day watching videos. Shifting into the 42T has been consistent and easy. Added a 1up 32T N/W to the front with a x9 Sram Type II, shifting has been on point, chain slap non-existent and if i were a gram counter I'm sure I dropped some weight as well. easy to install. the 16 t cog is great to keep the steps consistent. Nice to have an 11x42 range. Works amazing. I have nothing to say, but BUY THIS RING! Bought it, tried it. Decided to stay 11-36 in 1x10 for now. Parts are nice and fit well, system works as designed. Running 1/11 or 1/10 you sometimes need the extra gear when going up extra steep hills. The 40 tooth gear allows the 10 speed cassette function as well as an 11. the 16 tooth gear ratio change form the 15 and 17 is not noticeable. The functionality offered by this setup is amazing. Wore out my 40T One Up so replaced it with the 42T, works as expected, no complaints. Mated to a 10 speed 11x36T Shimano cassette and 10 Spd LX derailleur, wasn't sure the derailleur would have enough range for the larger 42T ring. Had to insert a longer hanger adjustment screw and trim the chain guide on the derailleur arm to make it work because it was just hanging a little on the one up, but it all works fine now. great to have a bailout gear on the 1x10 and not having to drop $$$ on a 1x11. needed to get a longer B screw and replace the chain. may get another to convert the full suspension 29er. Great upgrade! Just went from 3x10 to 1x10 and couldn't be happier! No more chaindrops, and the best part is not having to think in what gear you are. Converting my bike from 2x10 to 1x10 and wanted to add a 42t cog to my 11-36 cassette to make my climbs easier, the components from OneUp are strong and light and look really nice. Very happy with the purchase. I have a BMC TF03 running on a 2x10 setup. Is this compatible? I wanted to make sure before purchasing it. BEST ANSWER: Mine was fitted to a Sram 11-36 2x 10 set up,no installation or set up issues,and have been running fine for more than a month,so compatibility is not an issue either.Very happy with the product.,it seems it is compatible with your shimano setup,go for it.